Hello everyone! 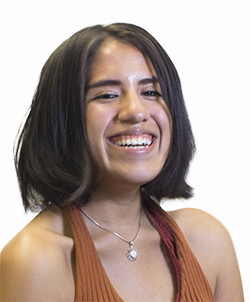 My name is Luz Rioja and I am the Multimedia Editor of Fall 2018. I am a senior majoring in English with a specialization in media and film theory. My background in film production is mainly in narrative and experimental filmmaking, but ever since joining the Daily Californian, I have realized the power that media has in helping me engage with my peers and local community. Tag along as Multimedia staffers Sarah and Luz show you the best places to thrift on campus and around the city! Take a listen to Multimedia Staffer Autumn Awbrey as she takes to the spotlight with her voice. Fashion Friday: Are you a typical Berkeley fashion student? Do you just wear Birkenstocks and oversized T-shirts orrr? POPCORN PAPERBACK TRAILER has arrived! Tune in on October 10!!! This new podcast is a collaboration between Multimedia and Arts & Entertainment, produced by Music Producer, Mark Jon Harris, and hosted by Arts Reporters and Jericho Improv members Charlie Kruse and Jackson Murphy! Defeating the Stanford Daily: INK BOWL matches begin! Preparing to outbeat the Stanford Daily in a long time rivalry match of flag football, Daily Cal staffers prepare for the final BIG GAME every weekend!! The Daily Cal’s Weekly Sports RECAP! Get caught up on EVERYTHING about Cal’s sports teams for this week! Astronomy professor Alex Filippenko and Music professor Emily Zazulia talk about how their love for literature bridges the gap between their different fields! They didn’t care about learning where I was from. They wanted to hear about palm trees and beaches. Relive one Berkeley’s many vintage markets!